Overview: The 2014 West Africa Ebola outbreak highlighted severe weaknesses of Liberia's health information systems. Healthcare workers didn’t have the information they needed to make vital decisions—decisions that meant the difference between life and death. Health workers like Wislyne were left isolated and alone to fight this mysterious disease from the heart of the jungle. But, she, along with many others, continued to fight. "Being a nurse is like being a soldier. You cannot take your uniform off when there is battle. Then you are not a soldier. So I went on the frontline because I wanted to save lives," she remembers. In response, USAID and UNICEF teamed up to create a communication channel to health workers from inside the Ministry of Health. The new system, mHero, connects health workers to the central ministry using the mobile phones that most health workers already have. “I think one of the values mHero brings to the Ministry is, we are able to communicate directly with frontline heath workers,” says Stephen Gbanyan, the Director of Health Information Systems at the Ministry of Health. Before mHero, the Ministry of Health would reach out to different county health centers and then they would have “to drive to almost all the facilities to get the people aware,” he says. During a recent disease outbreak in Liberia, the Ministry of Health used the technology to communicate symptoms of a then unknown disease, now identified as meningitis, to over 4,400 health workers. The Ministry of Health would not have been able to conduct this rapid and mass communication without USAID's investment in this technology. Since Ebola, Wislyne has started using mHero and now feels more connected and informed. She says, "If this program just stopped without things being in place, it would carry our work backward. It would make my work longer and delay treatment of the patients." Goal: Our objective was to produce a film that would help humanize USAID's work in technology. USAID plans to use this film to show the value and impact of technology during presentations with stakeholders in the development, government and private sectors. Challenges: One of our team members arrived in Liberia a week early to do pre-interviews. This helped with structuring the narrative. Yet, one thing we couldn't control was the weather given that it was rainy season in Liberia. On the first day, we were able to fit the interview in before the rain started coming down. The next morning, we got up before dawn in the hopes of shooting a sunrise shot. Unfortunately, this did not happen but we were still able to fly the drone and get the opening shot we needed after the rain subsided. Wislyne S. Yarh Sieh—officer in charge at Kpallah Community Clinic. MONROVIA, LIBERIA: August 23, 2017 - During the Ebola outbreak that started in 2014 there was no centralized system for the Ministry of Health to communicate to all healthcare workers across the country at the same time. UNICEF and USAID teamed up to create a platform that utilized mobile phones to facilitate a two way communication system between healthcare workers and the centralized ministry. Now healthcare workers receive text messages on their phones with vital information when there is a health emergency. They can also use their phones to send important information like the status of supply stocks in the clinic. Photo by Sarah Grile. BREWERVILLE, LIBERIA: Aug. 22, 2017 - Wislyne S. Yarh Sieh is a registered nurse and Officer in Charge (OIC) at Kpallah Community Clinic in Brewerville. Wisylne worked as a healthcare worker during the Ebola outbreak in 2014-2015. Healthcare workers like Wislyne were left isolated and alone to fight this mysterious disease from the heart of the jungle. But, she, along with many others, continued to fight. "Being a nurse is like being a soldier. You cannot take your uniform off when there is battle. Then you are not a soldier. So I went on the frontline because I wanted to save lives," she remembers. The Ministry of Health did not have a centralized system to communicate vital information to healthcare workers across the country at the same time. UNICEF and USAID worked together to create a platform that utilized mobile phones to facilitate a two way communications system between healthcare workers and the centralized ministry. Because of this new technology, healthcare workers across the country can receive text messages with important information about health emergencies. They are also able to use their phones to inform the Ministry of Health about the status of stocks in the clinic. Since Ebola, Wislyne has started using the new platform and now feels more connected and informed. She says, "If this program just stopped without things being in place, it would carry our work backward. It would make my work longer and delay treatment of the patients." 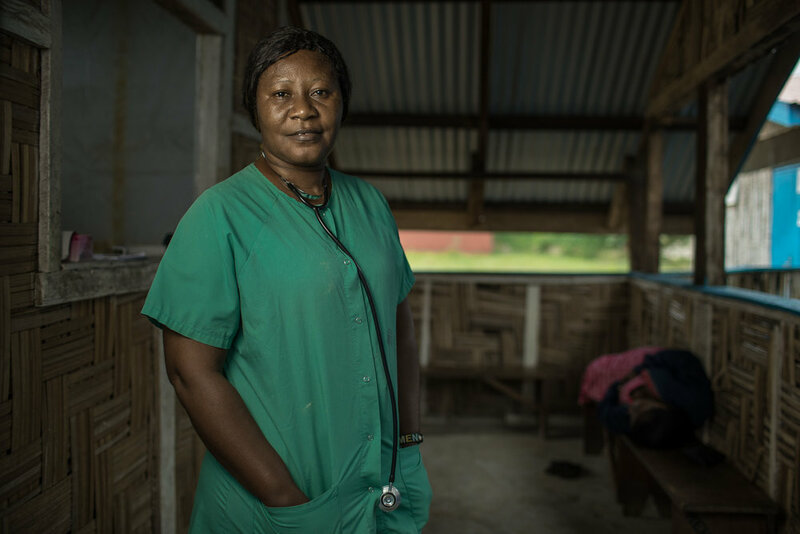 BREWERVILLE, LIBERIA: Aug. 22, 2017 - Wislyne S. Yarh Sieh is a registered nurse and Officer in Charge (OIC) at Kpallah Community Clinic in Brewerville. Wisylne worked as a healthcare worker during the Ebola outbreak in 2014-2015. Healthcare workers like Wislyne were left isolated and alone to fight this mysterious disease from the heart of the jungle. But, she, along with many others, continued to fight. "Being a nurse is like being a soldier. You cannot take your uniform off when there is battle. Then you are not a soldier. So I went on the frontline because I wanted to save lives," she remembers. The Ministry of Health did not have a centralized system to communicate vital information to healthcare workers across the country at the same time. UNICEF and USAID worked together to create a platform that utilized mobile phones to facilitate a two way communications system between healthcare workers and the centralized ministry. Because of this new technology, healthcare workers across the country can receive text messages with important information about health emergencies. They are also able to use their phones to inform the Ministry of Health about the status of stocks in the clinic. Since Ebola, Wislyne has started using the new platform and now feels more connected and informed. She says, "If this program just stopped without things being in place, it would carry our work backward. It would make my work longer and delay treatment of the patients." Photo by Sarah Grile.